Boo Yong Joo (Han Suk Kyu) is a genius and triple-board certified surgeon, who was once at the top of his field and used to work at Seoul’s top hospital, Geodae. After a traumatic incident, he disappears and changes his name to Kim Sa Bu (Teacher Kim) to work at a small hospital named Doldam, which is located at Gangwon Province. 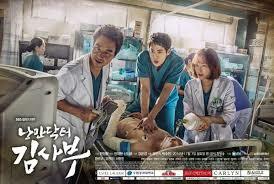 He guides Kang Dong Joo (Yoo Yeon Seok) and Yoon Seo Jeong (Seo Hyun Jin) to become great doctors there, teaches them to fight against power and money for the sake of patients. I think this is the best medical drama I've ever watched. The ethical issues portrayed are excellent. Well, some are not that realistic but the story line itself is daebak! I loved how real everything felt, and how all the cases were at least somehow realistic. Medical dramas are my favorite genre, so for a change I actually looked every medical term up, so i learned alot, I could be a doctor and work alongside them. I love the character developement in this drama. Every single character had something to do in the drama, and the harmony between them was so good. The main couple was no joke either, they aced it. Yoo Yeon Seok and Seo Hyun Jin should stay in the medical field, and together! To sum it up, it had a little of everything, easy drama to fall in love with.